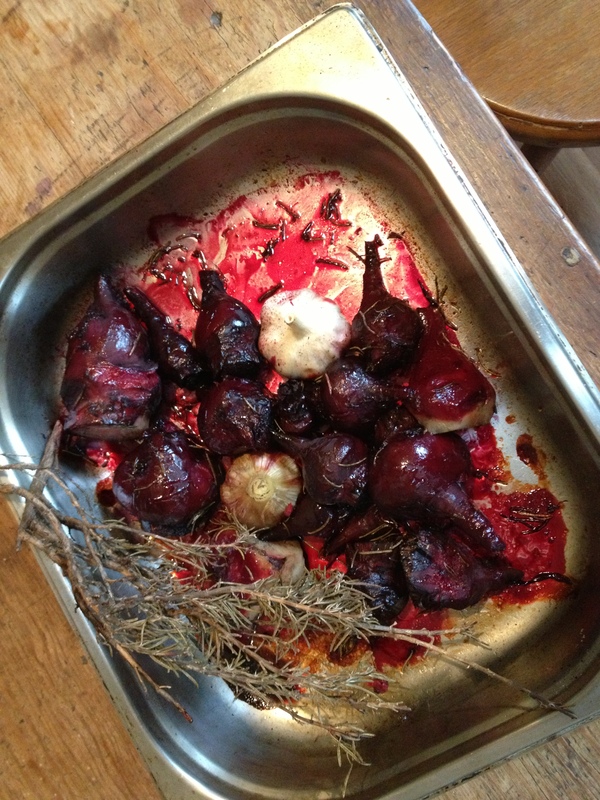 Just out of the oven: beetroot, turnip, whole garlic and rosemary, drizzled with a bit of olive oil, covered with foil and baked at 200 degrees for about 40 minutes. Sunday lunch from the veg patch. I harvested several beetroots and (accidentally) one turnip. I cut the leaves from the bulbs but left about 1cm to stop the bulb from bleeding, washed the leaves well and put them in the fridge . The leaves will make another dish some time during the week. It took a bit of scrubbing to get the grit out of the beetroot without damaging the skin too much but that is one of the joys of backyard farming – the supermarkets stock things that have been cleaned/preserved/chemically bombed and one does not have to spend so much time on washing! I put everything in the pan and in to the oven. The taste was wonderful and the thick, rich beetroot juice mixed with the garlic and rosemary flavours on the bottom of the pan was sopped up with a bit of bread. The garlic is soft and spreadable and can be eaten with bread or squeezed out of the skins to eat on its own. What have I missed? The glass of red, of course!